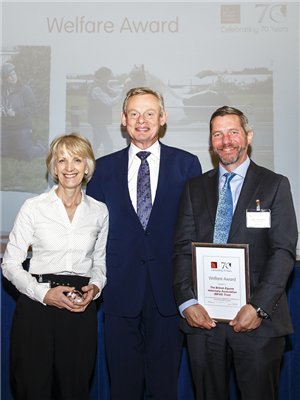 The BEVA Trust, which is the association’s volunteering arm, was presented with the BHS Welfare Award ‘for excellent service in the cause of equine welfare’. It was received by Julian Samuelson, Chair of the BEVA Trust and Fiona Cunnington, BEVA Trust Secretariat, from BHS President Martin Clunes. The BEVA Trust provides opportunities, support and funding to allow members of the veterinary team to volunteer for projects that enhance equine welfare both locally and globally. Through the support of the BEVA Trust, volunteers have supported the BHS health care campaign and have castrated 342 horses over the past two years. All this support has come in the form of vets, nurses, students, and farriers volunteering their expertise for the day. A total of 729 horses have now attended the health care clinics. You can find out more about the BEVA Trust’s work here.